The vertical jump test (a.k.a. Sargent jump test) tests how high an athlete can jump from standstill. Test performance is highly correlated with player potential in fast-paced sports such as basketball, football and soccer. It is therefore a major assessment criteria in both the NBA draft and NFL combine. The NBA draft and NFL combine use the vertical leap test to gauge a prospect’s explosiveness (agility and speed). In fact, the NFL combine considers the vertical jump test to be the best indicator of a player’s natural athleticism, ahead of the 40 yard dash and long broad jump. If you have an upcoming vertical jump test, it is helpful to familiarize yourself with it in advance. Practicing beforehand can also yield quick improvements to your test performance, because there is an element of technique involved. Even if becoming a professional athlete is not on your radar, keeping track of your vertical jump is still a good way to gauge your agility and quickness. Lastly, for obvious reasons, testing your jump at regular intervals is essential if you are in the process of training your vertical jump. There are a variety of methods that can be used to measure vertical jump. Some are cheap and only require very basic equipment, while others are more expensive but more accurate. This is the simplest and cheapest method. You only need access to a wall and some chalk to leave a mark on the wall. You should repeat the test a few times and calculate the average in order to make the result more accurate. 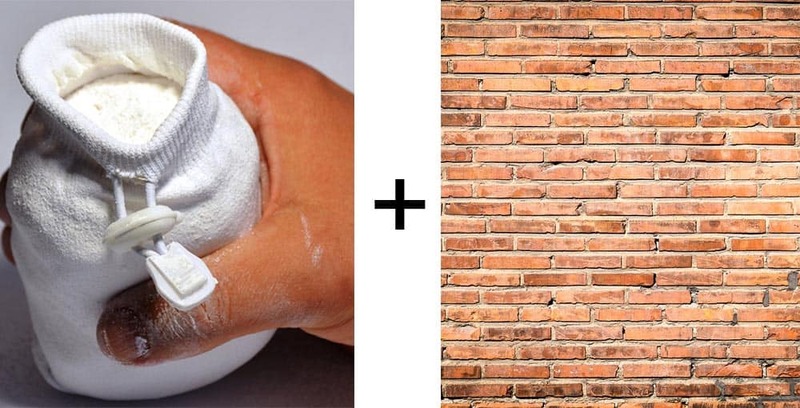 Crushed chalk is used to chalk your fingertips. Crushing solid chalk is difficult so I would recommend purchasing a bag of Crushed Chalk . 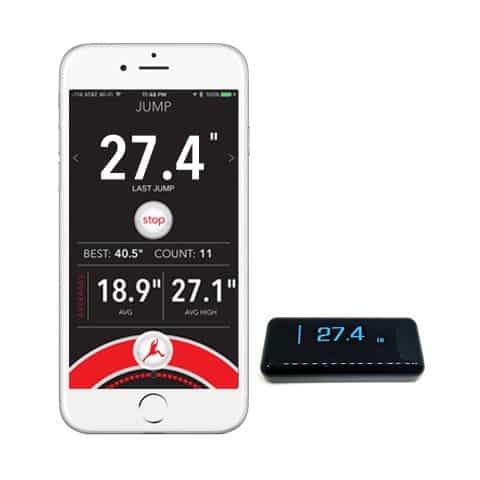 The VERT Wearable Jump Monitor is a wearable device that measures your vertical jump and logs data on your smartphone. Its biggest advantage is that you can have complete freedom of where you can test your jump. You can do it at home, on the court or in the park. It’s also good if you want to test different kinds of jumps. For example, you can test your jump with a leading run up or with a basketball in hand. The VERT jump monitor has a phone app that takes the hassle out of recording test results and presents your jump data nicely. The accuracy of the results is generally good, but not perfect. It is typically within 0.5″ of your actual vertical. 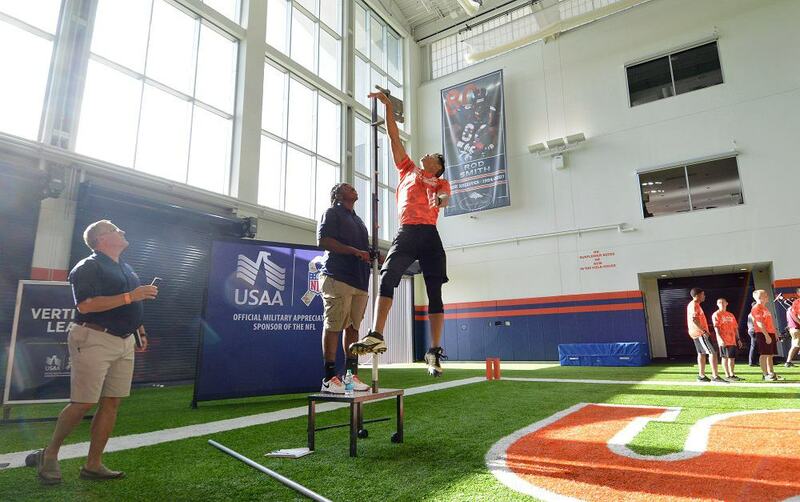 The Vertec device is used to measure the vertical jump of NBA draft and NFL combine prospects. It measures to the nearest 0.5″. The device consists of a tall standing pole and plastic swivel vanes which can be displaced. The highest swivel vane that is displaced by the test subject is used to calculate the their vertical jump. It is not the most accurate way of measuring a person’s vertical leap, but tests can be conducted quickly and it is accurate enough for most purposes. The Vertec device costs around $699 and is quite large so it is not an ideal choice for home testing. The most accurate, but also by far the most expensive, is to use a force plate. 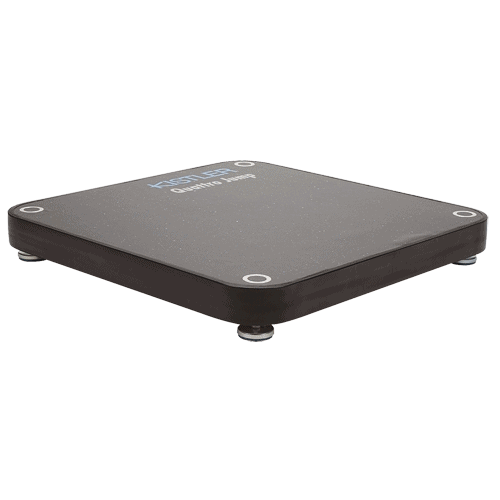 Force plates work through the use of piezoelectric transducers which accurately detect the amount of force being applied to the plate during take off and landing. It uses this information to accurately measure vertical jump. They are mainly used for scientific research purposes as this level of test accuracy is not typically necessary. However, the NHL combine uses Force Plates for vertical jump testing. A force plate will set you back $10-20k, so they are not a feasible solution for ordinary people. However, a comparable device is the Just Jump System which is a mat you can jump on. The Just Jump System records how long you are in the air for (your hang time). Since gravity is a constant, from this information it is able to work out your vertical jump. Got your vertical jump test result and want to know where you stand? We have created the chart below to give you something to evaluate your performance against. The chart was created by looking at data from Explosive Power and Strength (CHU, 1996), VCE Physical Education 2 (ARKINSTALL, M et al. 2010) and NCAA statistics. Testing yourself straight away will underestimate results as your body will not be functioning optimally. It will also reduce any risk of injury. To warm up, perform some dynamic leg stretching and some warm up jumps. Swinging with both arms during the upward jump motion has been found to produce a more powerful jump as you can take advantage of extra momentum. At a professional level, in order to ensure fairness, test subjects are often told to either swing with both arms or only use one arm. Fatigue plays a very big role in jump performance. On top of muscle fatigue, central nervous system fatigue can also affect performance. Central nervous system fatigue is best described as a feeling of exhaustion and sluggishness as opposed to soreness felt in muscles. Your fast twitch muscle fibers are far more sensitive to this type of fatigue, so performance can be drastically influenced. It lingers for up to 3 times as long as muscle fatigue, meaning recovery could take up to a week. Getting good quality sleep is the most effective remedy. Plenty of athletes have a powerful vertical jump without ever specifically training for their vertical jump. Training in and playing certain sports like football or volleyball will inadvertently train up your jump. However, the best way to rapidly improve your vertical leap is through specialized jump training. You can learn more about this kind of training in our Ultimate Jump Guide.